This is the personal advertisers section for Scotweb. This section of the forum was designed to allow our members direct access to Nick at Scotweb. This section is intended for the advertisers to have a personal place to post news, sales, and information about their companies that they would like our members to know about. This section is also for our members who want to ask a question of, or make a comment directly to, the advertiser. They should be thought of as direct one-on-one communication between our members and our advertisers. Finally, this section is to give our members a specific place to post reviews of products and the services they received from Scotweb. I recently found Scotweb online and successfully ordered a couple of items, however, a clan tartan tie and flashes ordered in November 2018 were a disappointment. I needed a match for my expensive handmade, made to measure kilt from a very nice lady in Kirkcaldy and used Scotweb's tartan finder to get a match. The tartan labelled McIntyre Old Hunting ANCIENT was a good match [though later Scotweb mentioned McIntyre Hunting ANCIENT was also a good match]. I ordered the tie and flashes based on their tartan finder, they delivered to my address in New Zealand. Unfortunately the items delivered were not the correct tartan even though they were labelled McIntyre Old Hunting Ancient. 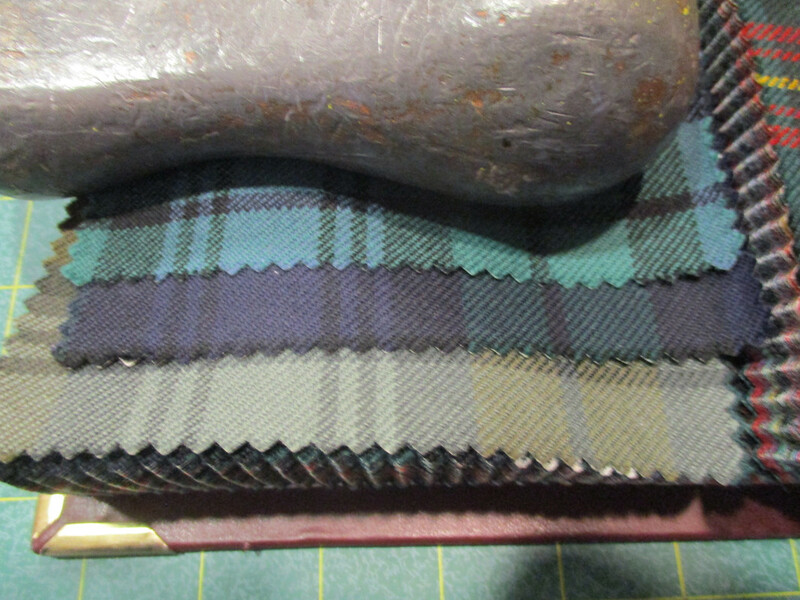 On Scotsweb's tartan finder I identified the tartan as McIntyre Old Hunting MODERN. Photographs of the tie and flashings lying alongside my kilt showing the contrasting tartans and were sent to Scotweb who asked me to post the items back and they would refund the postage price. Scotweb acknowledged receipt in Edinburgh. I send a photo of the tartan I needed taken from their tartan finder and asked them to make sure they sent the correct tartan this time as I needed it for a function in February. I was assured the correct items had been sent. Yesterday I received my new tie and flashes - GUESS WHAT!!!!! SAME ITEMS SENT BACK WITH INCORRECT TARTAN. I WILL NOT USE SCOTWEB AGAIN. Just a question... why did you need to use a 'tartan finder'? What tartan was your kilt made from? Drink to the fame of it -- The Tartan! Would you kindly post the photos of your kilt and the items that you received. I knew what my tartan was and my new kilt replaced my old kilt of the same tartan but as Scotweb have a tartan finder I was interested to look at others of the same clan. I have a series of McIntyre tartan ties but the McIntyre Old Hunting Ancient is my favourite pattern. I found the correct tartan on the finder and so was confident I would not have a problem in using the stated description. The order arrived on Friday 11 January 2019 and I noticed the tie and flashes tartan did not match my kilt. Hamish replied and asked for a photograph which I sent showing my kilt, an old matching tie and the obviously incorrect tartan on the new tie and flashes and pointing out your tartan finder identified the correct tartan as McIntyre Old Hunting ANCIENT and your finder showed I had been supplied with McIntyre Old Hunting MODERN. The items sent were incorrectly labelled McIntyre Old Hunting ANCIENT. If the supplied tie and flashes are indeed correctly labelled [which I doubt] then your tartan finder is incorrect. On 24 January 2019 Kerisa wrote that the mill had made a mistake and I had got ANCIENT not MODERN. on 25 January 2019 Kerisa then stated that she would therefore send me the old ones back again and that they were non-returnable as they were made to order. On 25 January 2019 I sent Kerisa an email which included shot of your website with the pattern of the tartan labelled as MacIntyre Old Hunting Ancient and requested that this should be the pattern sent back to me and not the original items returned. I have just received the original items as shown on my original photos. Complete chaos and errors somewhere in your or the mill's systems. I ask again, please post the photos of your kilt and of the items you received. One of the functions of X Marks is to allow open and honest reviews of kilts, kilt related products and services. Product Reviews are the best way for new members to gain information about suppliers. We encourage our members to post Product Reviews. All reviews must be about a product purchased for the members own use. Product reviews must contain only verifiable factual information. Negative product reviews are also encouraged as an important warning to other potential buyers, but the reviewer must be very careful not to denigrate or libel the manufacturer or supplier. Negative reviews must contain only verifiable factual information. If member wishes to post a review, of a product purchased from one of our advertisers, it would be best if the review is posted in that advertisers section of the forum. Please notice the section that I have highlighted in red. Also please notice "Negative reviews must contain only verifiable factual information." So far I have not seen facts presented which can be verified. It is incumbent you, the poster, when presenting information, to also offer some method that the information you present may be verified to be facts. Last edited by Steve Ashton; 9th February 19 at 11:16 AM. Dear Mr Ashton, thank you for pointing out the policy on product reviews. I have a complete file on this case and can verify all the statements I have made should you wish to sue me for libel. I would have thought your company should be able to access the information especially as I have given you very precise dates of our communications though the time difference between NZ and the UK means an e-mail sent on Tuesday morning from NZ may log as received on Monday evening in the UK. I am not sure how to post a photo on this site for all to see, or even if it is possible, so I will send a photo of my kilt, old tie, your new tie and flashes showing the stark difference in pattern for you to view as an attachment to an e-mail sent to you via my previous contact Kerisa at Scotweb. I await your response when you have viewed my photo and compared it to the tartan you label as McIntyre Old Hunting Ancient on the Scotweb website tartan finder which is a good match for my own kilt. The new photograph will have the items in a different arrangement so you be assured it is not a repeat of the old photograph. Perhaps you misunderstood. If you would care to look at the title under my name I am the owner of this forum. I am not Nick from ScotWeb and do not represent ScotWeb in any way. I am stating the policy of the forum. Your beef is with ScotWeb. But you chose to air that beef here on this forum so must abide by the policies of this forum. If you are unsure of how to post the photos backing up your claim on this forum, please feel free to forward them to me via email and I will post them for you. Last edited by Steve Ashton; 9th February 19 at 01:58 PM. I was just about to send the photograph to Scotweb when I realised my mistake and that you actually the owner of the forum and not attached to Scotweb. Thank you for your e-mail address and I will forward the photograph to you via that e-mail. Sorry again for the mis-understanding. I got your email with this photo. We can now see where some of your confusion comes from. If you will notice each Tartan is a slightly different color. This is primarily due to the dye lots used by the different weavers. It appears to my eye that all four are the ancient colorway. The left tie may be the Modern colorway but it is labeled as Ancient. It is possible that this weaver uses colors much darker for their Modern version. Like this very dark version from another weaver. There is also the problem with the different names that the weavers use. One weaver uses the word "modern" to describe the colors they use, when they intend the Tartan to look like it would, when dyed with modern aniline dyes. They use the word 'ancient' to denote a simulation of what the Tartan may look like if it were dyed with natural dyes. They then use the word 'weathered' to denote a simulation of what the Tartan may look like if it had been out in the sun and faded. Other weavers use terms like 'Reproduction' and 'Muted' and even OC for their particular colors. But these are all the same Tartan. Then we sometimes run across odd or unique names for the Tartan designs themselves. The names you found on ScotWeb are different from the names used on the Scottish Register of Tartan. On the Register there are 6 different designs under the name MacIntyre one of them is MacIntyre Hunting, (#2845) but there is no design listed as Old MacIntyre Hunting. On the ScotWeb site both the MacIntyre Hunting and the Old MacIntyre Hunting are the same design. Both of these are available in Modern, Ancient, and Reproduction color versions of the exact same Tartan. So it is possible that one of the things you are running up against is that the fabric your kilt is made from, is from a different weaver than the ties and flashes that you were sent. You may also notice that on the ScotWeb site there is a Tartan listed as "New MacIntyre Hunting". This is a fabric woven by the Weaving mill Marton Mills in a 12 oz Poly/Rayon blend. This name is different from the name used by the weaver who list this as MacIntyre (New/H). Please note that these colors are very dark. 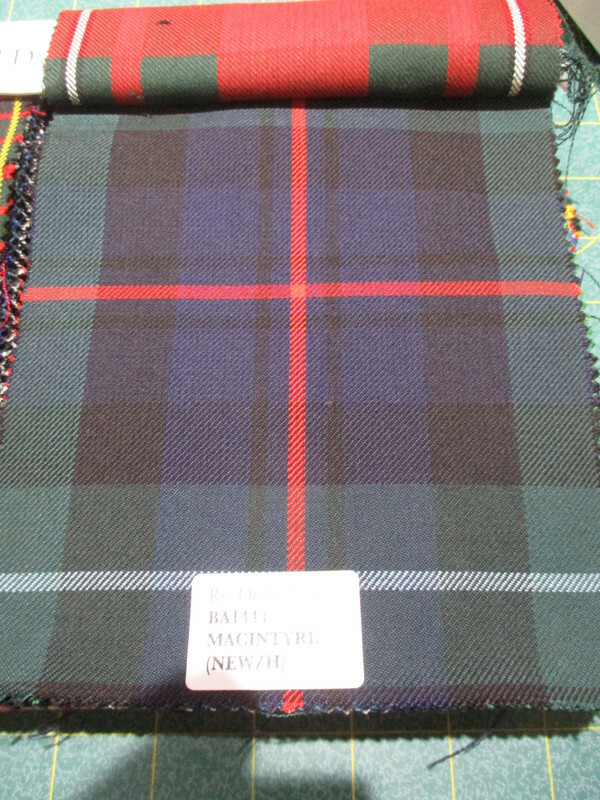 About like the colors used in the Black Watch Tartan, Modern colorway. Below are the Ancient, Modern, and Weathered versions of the Black Watch Tartan. And while the colors used are very different, all are exactly the same Tartan. This is one of the reasons that we suggest that if you want the colors to match exactly, that you order fabric all from the same weaver. Preferably at the same time, so you get fabrics dyed from the same dye lot. Is there perhaps a label inside your kilt that lists, not the person who sewed the kilt, but the weaving company that wove the fabric? If not, can you inquire from the person who made your kilt, which mill they sourced their fabric from? Last edited by Steve Ashton; 9th February 19 at 04:15 PM.